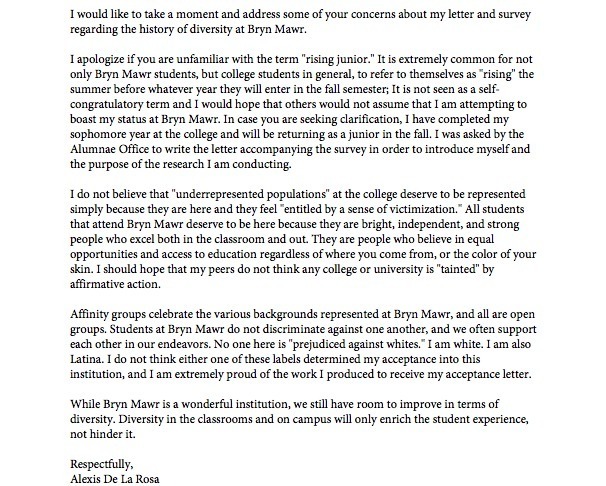 In response to her survey, Alexis received an unexpected communication from one alumna. An excerpt of that message, and Alexis' reply, are seen at left. Here she recounts her reaction. When I received this message, I experienced an influx of different emotions. I stared at the screen for almost an hour. I waited to reply to this alumna for about a week. Although I was extremely hurt, I knew that I could not just ignore this message. After much deliberation, I replied. It was difficult for me to understand how I could share a connection with this alumna who made such negative assumptions about my character and position within this institution. I received an array of responses from alumae/i of the college, but this is one I will never forget. 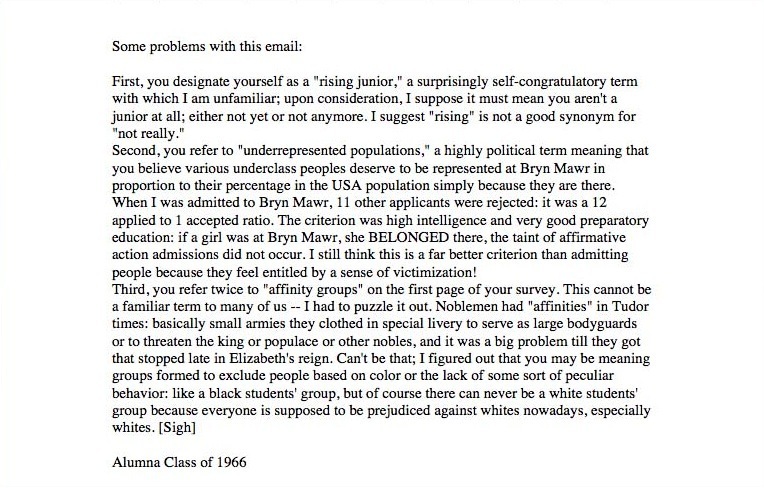 In the end, this message reignited my desire to learn about the history of diversity at the college, and forced me to realize how much we still need to grow. All students that attend Bryn Mawr deserve to be here. Bryn Mawr students are bright, independent, and strong individuals who excel both in the classroom and out. They believe in equal opportunities and access to education, regardless of where you come from or the color of your skin, which aligns with the College's initial mission to provide access to education to those who might not otherwise receive it.